We wrap our 11th season with a program of some of the 20th century’s most notable composers. 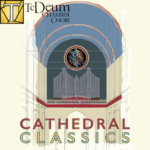 Focusing on familiar music designed for the warm acoustics of the world’s greatest cathedrals, the audience will experience a cappella classics by Byrd, Barber, Britten, Mendelssohn, Stanford, Rachmaninoff and more. Come hear this music in two of Kansas City’s most acoustically beautiful churches, the Cathedral of the Immaculate Conception and Village Presbyterian Church. Select the number of tickets, enter contact and payment information and then finalize your order below by clicking Buy Tickets Now. No physical tickets will be issued for this performance. Your name will be on the will-call list at the ticket counter, along with the number of tickets purchased. Copyright © 2012 Te Deum. Te Deum is a 501(c)(3) nonprofit organization.